Leading expedition cruising specialists Aurora Expeditions have launched their 2018/2019 Antarctic program with an exclusive Early Bird Offer, giving travellers the chance to save up to 15 per cent across all newly-released itineraries when booked before 30 June 2017. The first 40 passengers to book will also receive a $100 onboard credit to enjoy during their expedition. The new Antarctic program continues to cater for adventure-seekers and nature lovers, offering a range of 11- to 18-day voyages across various destinations including the spectacular Antarctic Peninsula, the wildlife oasis of South Georgia, the wild Weddell Sea and the historic Falkland Islands. The program features 11 small-group expeditions aboard the 54-passenger vessel Polar Pioneer, all departing between November 2018 and March 2019. After the success of the inaugural Sub-Antarctic Safari, the expedition returns to explore the Falkland Islands and South Georgia. Passengers will revel in close encounters with the region's incredible wildlife including some of the world's largest king penguin colony, elephant and fur seals as well as diverse birdlife. Also featuring complimentary photography workshops, the 15-day expedition is the ultimate sub-Antarctic exploration. The expedition departs 17 November 2018 and starts from US$11,100 per person. For adventurers seeking the ultimate end-of-year celebrations, the 12-day Christmas in Antarctica is the chance to experience a white Christmas amongst spectacular landscapes and fascinating wildlife. Travellers also have the chance to ring in the New Year on the white continent surrounded by penguins with the 11-day New Year in Antarctica. Trips depart 18 December 2018 and 29 December 2018 respectively and start from US$9,100 per person. Time-conscious travellers will make the most of their Antarctic adventure with the Fly & Sail Antarctic Explorer. Including a one-way flight directly into Antarctica, passengers enjoy more time exploring both sides of the Antarctic Peninsula and less time at sea. The 11-day itinerary departs 2 March 2018 and starts from US$9,700 per person. Now open for bookings, all of Aurora Expeditions' 2018/19 Antarctic voyages include accommodation aboard ice-strengthened 54-passenger Polar Pioneer including meals and daily cabin service, daily Zodiac excursions and shore landings, educative talks and lectures from expert naturalists, historians and geologists. Passengers will also have the choice to join optional ship-based adventure activities such as sea kayaking, polar snorkelling and diving, and mountaineering (surcharge apply), as well as polar photography. 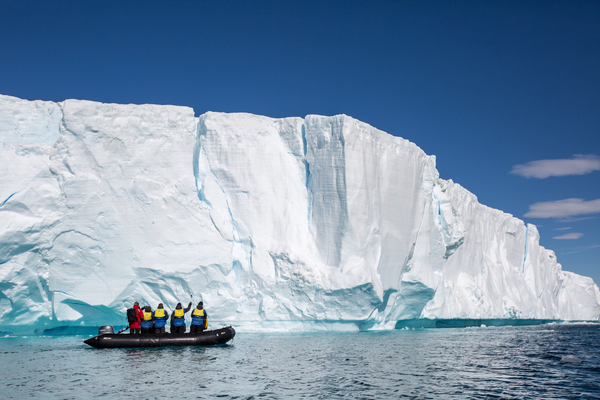 All passengers will also receive a complimentary 2-in-1 waterproof polar jacket to keep, as well as a professionally-produced printed photo book of their voyage after their trip. EXCLUSIVE OFFER - Early Bird Offer & $100 Onboard credit*Save up to US$3,255 per person when booking on Aurora Expeditions' 2018/19 Antarctic voyages with their Early Bird Offers of up to 15% off. Plus, be one of the first 40 passengers to book and you'll receive a complimentary $100 onboard credit to use during your expedition. Conditions apply. For more information on Aurora Expeditions' 2018/19 Antarctica cruises visit www.auroraexpeditions.com.au, email info@auroraexpeditions.com.au or call 1300 061 490.